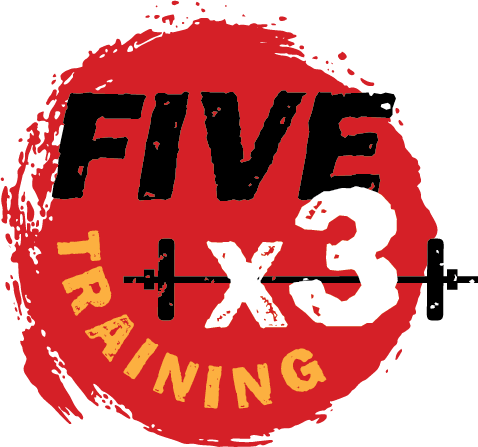 What’s in a name: Welcome to FiveX3 Training. Five sets of three. Three sets of five. Whichever way you read it, FiveX3 spells strength. Low reps and high weights is how damn near everybody who is strong got there in the first place. We chose our name very carefully. It reflects our training philosophy and our goals. In sports, as in life, strength is tightly correlated with performance. All things being equal, a stronger athlete is better than a weaker one. And, believe it or not, a stronger mother, teacher, doctor, or accountant, is more functional than a weaker one. Especially for those of us in sedentary professions, strength training is critical for injury and pain prevention. More back pain than you can imagine is caused by strength imbalances, rather than traumatic injuries, and a proper strength program can be very effective at treating it. Physical strength also begets mental fortitude. The focus and commitment required by a heavy set of deadlifts is hard to match. And the confidence generated by seeing your strength improve over time, carries over to all areas of your life. At FiveX3 training, we will help you discover just how strong you can be. It does not matter who you are. It does not matter what you do. Old or young, beginner or advanced, it is always the right time to train better. Come work with us. You will surprise yourself.